Having a backyard is fabulous—trust the woman who spent most of her life in a yardless apartment. The trend today is to fill that glorious running, jumping, free-play space with elaborate swing and play sets. I know my rugrats would love one of those sets—and I would have too as a kid. 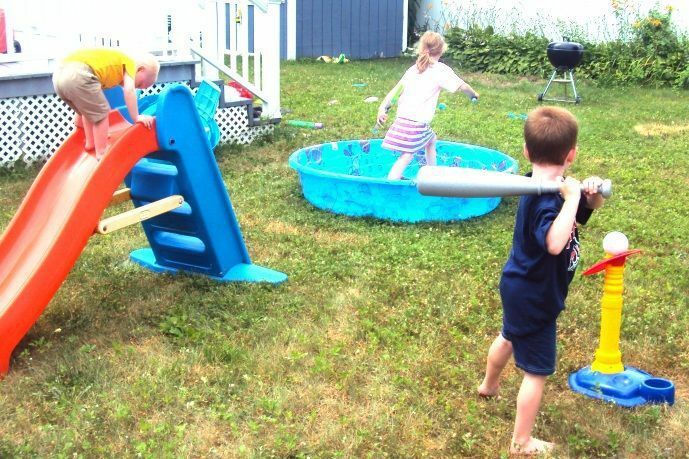 But you don't have to invest hundreds—or thousands—of dollars in an elaborate playground structure to make your backyard an exciting, physically challenging, boredom-busting play spot the whole neighborhood will want to line up to enjoy. One of the easiest and most fun options you have is setting up an obstacle course in the middle of your yard. There are many reasons to go for the big, impressive swing set, but there are three big reasons that you might want to forgo those play sets for toddlers. Most of the larger background play sets are made for ages 3 and up. That means your little ones may not be ready for the climbing, sliding, swinging, and scaling that's required (at least not without a lot of close adult supervision). While, of course, swings, slides, and monkey bars offer great opportunities for fun and building gross motor skills, a backyard of open spaces and a collection of random toys and activities encourage free play and imagination. Obstacle courses are made to be changed up and revised constantly. The swing may forever go back and forth that large hoop might be Hula hoop challenge one day and part of an oversized ring toss game the next. n other words -- it never gets old, never gets boring. There are no rules but there are some guidelines to help you plan a fun, safe course for little kids. Something to climb: Toddlers live to climb. This is the one element where you may want to invest in a simple toddler-friendly slide or large soft blocks that can be safely stacked and mounted by an early walker. Something to throw: Balls, hoops, plastic bowling pins, old stuffed animals. This activity is a great way to build coordination as a toddler tries to aim and shoot the object at a pail or baby pool. Something wet: If you want giggles, give them a water blaster, water balloons, or even just a water bucket to carry from spot A to spot B. Bathing suits are optional, though. For some reason, getting wet when you're fully dressed actually makes them laugh harder. The aim is to keep the activities pretty simple and intuitive so young children can figure it out on their own. Although, having a few activities that require your toddler to listen and follow directions is a good way to nurture communication and cognitive skills as your little one develops. TO help your tot master the obstacles (and compete against siblings or friends), it may help to play a simple round of follow the leader before sending her out to do the course on her own.